Each day we meet with our math groups to do targeted skill work. We have grouped students from all three first grade classrooms who need to work on the same skill sets. During our time together we play games that focus on a particular math skill, work in our Everyday Math journals, use whiteboards to practice math concepts, play whole group games and use math apps to help students meet the first grade math standards. Here are a few photos from our work today! During October our first graders had the opportunity to play tennis at the Y once a week for FREE. We had a great time and our students improved so much in four, short lessons. 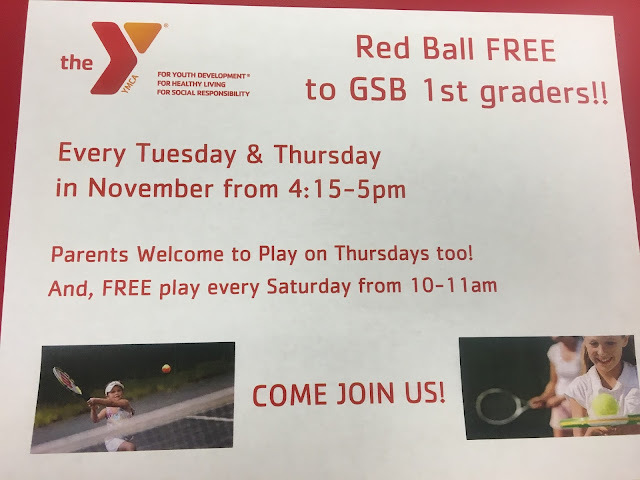 The YMCA in Damariscotta has offered FREE tennis every Tuesday and Thursday in November for first grade students. Please take advantage of this offer if you can. See attached flyer. Look out, we have a couple scary spiders in first grade! These spider headbands were one of our special Halloween crafts the first graders made! Our trip to Old Fort Western was a memorable one. Our first graders had the opportunity to learn about what life would have been like for them long ago. We learned how to start a fire with flint and charcloth, cut and split kindling wood, play games, make hot cocoa, grind cinnamon and sugar with a mortar and pestle, card and spin wool, and make a bed! A fun time was had by all. When we returned to school we decided we enjoy our modern conveniences like indoor plumbing and electricity!